Rating: 3.5/6 – I liked it! Synopsis from NetGalley: Beauty versus beasts. Lane McEvoy can’t imagine why anyone would risk it. She’s grown up in the shadow of the great wall separating east from west, and she’s naturally curious about what’s on the other side – but she’s not that curious. Life in the west is safe, comfortable . . . sterile. Which is just how she likes it. 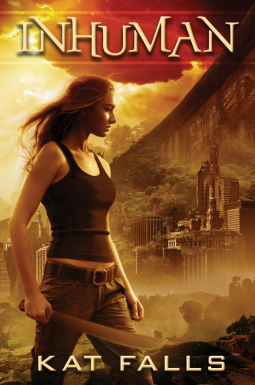 My Initial Thoughts/Rambling: This is another YA post-apocalyptic sci-fi with hints of dystopia, and while it wasn’t one of my favorites in the genre, it still holds its own and was an enjoyable read. Possible Spoilers Ahead. Disclaimer: I received a free copy of Inhuman from NetGalley in exchange for an honest review. What did I think about the characters? Lane, to me, was a bit weak at the beginning of the story, with her compulsion to sanitize her hands every few seconds, but once she finds that her father is at risk of execution, her development really started and she turned into a character that I was rooting for. There’s still parts of her that aren’t strong or outstanding, but that contributed to her believability and realism. She wasn’t the savior of the day, but she had the courage to try, and that’s why I warmed up to her pretty quickly after the first few chapters. Everson and Rafe, the two male leads/love interests (yes it’s a triangle – I’ll get to that in a minute), balanced out the trio with their polar personalities. Personally, I’m a Rafe girl. I felt like he was a lot more developed, and once he let down that cold, snarky front he had a lot to offer. Maybe it’s because I’m a sucker for those kinds of characters, male or female, but Everson really paled in comparison to Rafe. Everson seemed to be a bit less developed, and his back-story was a bit cliche for me. It was pretty easy to guess it, but it does further the plot so I let it slide. And the concept and plot? Concept: It was definitely unique, as far as this genre goes, so I have to give Falls points for that. The dystopia isn’t full blown tyranny yet, but more along the lines of a society protecting its citizens (which we all know will eventually degrade into tyranny, but that’s not for this book yet). After the release of deadly animal hybrids and a virus that wipes out half the planet, the western half of the US is quarantined and put on lockdown – any hint of germs is met with a 2319 code and a gaggle of those Monster’s Inc. yellow suits. So, while it’s still a dystopia, it’s still pretty unique amongst the oodles of other stories. Plot: I would have liked to see a bit more exposition, since I felt a bit like I was thrown into the water without knowing how to swim. I eventually found my footing, but it took me about 1/3 of the book to really get into it because I was still trying to understand everything. The middle third was all right, and I coasted along at a “yeah, I kind of sort of like this one” mood. The last third was where it really picked up, and that was when I really got into and had that heart-pounding “oh my god what’s going to happen? ?” And the ending was a huge cliffhanger – I need to know what happened! My poor baby Rafe… That’s all I’m going to say. I’ll be reading the next book just to find out what happens to him! What about the writing style? Like I said above, I wish I could have had a bit more world-building going on before the plot really progressed, but I figured it out eventually. As far as the love triangle – you all know I’m extraordinarily leery of these devices. At least this one was kind of inverted – instead of the girl pining after both boys, it was the boys going after the girl while she tried to focus on the real problem. Anyway, my ship didn’t sail, so now I’m grumpy. But that’s a personal problem, so you shouldn’t take it into account when considering whether or not you want to read the book! Anything else you’d like to add? Overall, I enjoyed the story. I’m not desperate to have the next book, but I’m interested enough to look out for the next one, if only to be rejoined with Rafe. Ahh, science-fiction zombie books — one of my favorite “genres,” I guess you could call it, so I’m glad that you liked this book! Character development is a must-have in books; Lane does sound like she goes through some pretty sturdy development, but this is what catches my attention the most: “ She wasn’t the savior of the day, but she had the courage to try” Finally! A protagonist who doesn’t save the day through sheer courage (or foolishness?) but still tries anyway. I think that’s much more doable and realistic. It’s not a true dystopian – only tiny little hints here and there. Don’t let it dissuade you!